It has been a little while since I played along with CASE Study so I decided to play along this week. 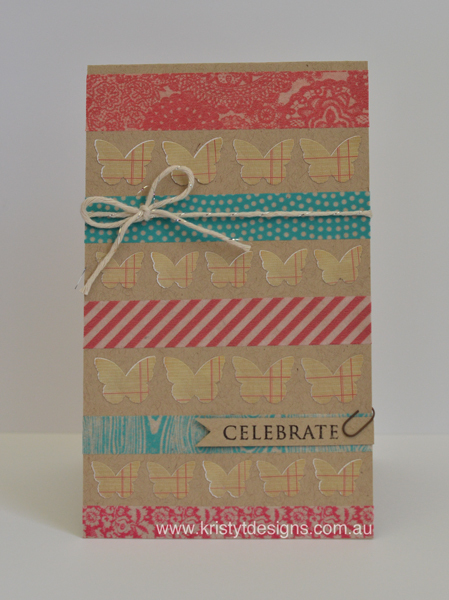 I created a simple card taking inspiration from the colours, the small banner and the butterflies on Jocelyn Olson’s card. 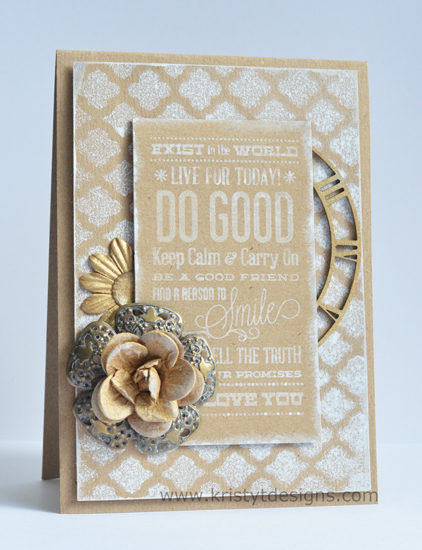 You can see Jocelyn’s card on the CASE Study blog here. I created some rows of butterflies using some stickers from Studio Calico to give a tone on tone look. I also added strips of washi tape in pink and green to give some colour to the card. 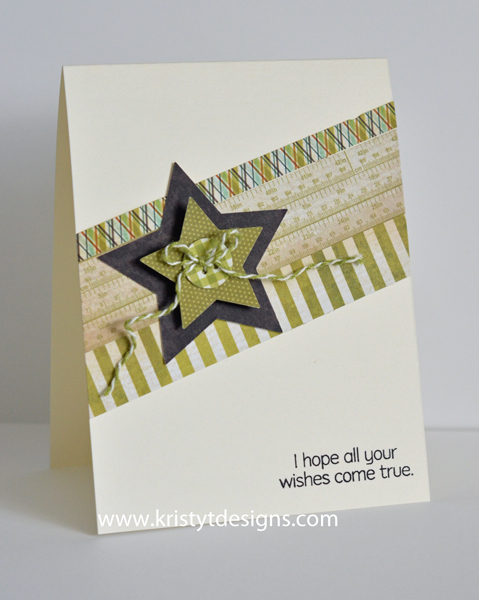 A twine bow, stamped sentiment banner and a mini paper clip finished off the card. 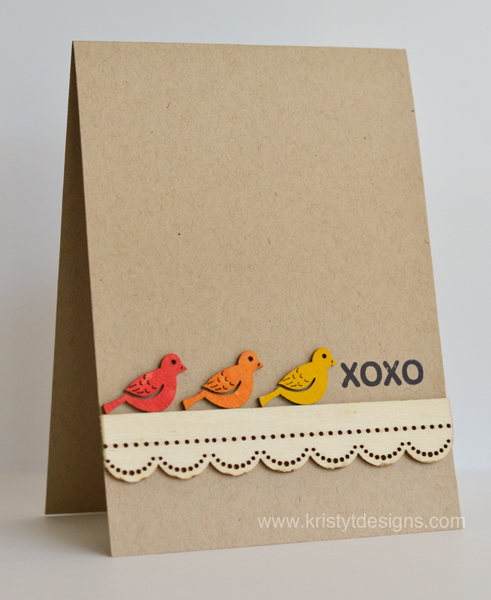 You could easily adapt this card design to use up patterned papers and leftover stickers. This is just a quick post since it is school holidays here so I have all my children home with me. I’ll be back tommorrow with my first Get It Scrapped assignment post. You can see the layout I made for the Creative Team Blog Hop here and you can check out the Get It Scrapped Blog here. 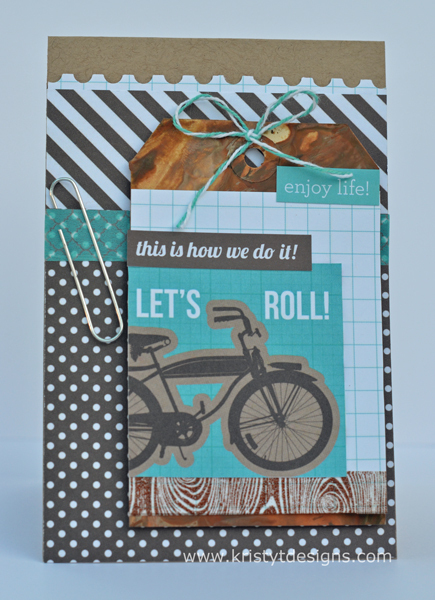 I hope you had a chance to hop along for the Get It Scrapped Blog Hop for lots of inspiration. You can see my colourful layout here but today’s project is very different. I am playing along with the last challenge with Maile Belles at CASE Study. You can see her inspiration card here. I have kept things super simple for this card and fairly similar to the Maile’s card. I grabbed some of the wood icons from Prima and some distress paint to colour 3 little birds. I left the scalloped border strip plain and stamped my sentiment with archival ink. I got some new metallic distress paints on the weekend and have made some tag backgrounds so will be back soon to share. I am playing along with Case Study Challenge #142 this week and Maile Belles is the Muse for the Month of May. I was in the mood for some water colouring so pulled out the I love Roses stamp set and stamped onto water colour paper. I used my distress markers to add colour to the images and then used a paint brush to blend the colours. When I water colour like this, I shade in the areas that I want to be darkest and don’t add any colour to the areas that I want to be the lightest. I normally use the lightest colour ie for the leaves I used Peeled Paint and shaded around the edges and in the areas of where there is shading already part of the image. I then added Forest Moss over the top of some of the areas too. Then I use the paint brush to blend out the colours, starting in the darkest areas and then filling it in the white areas. This is an easy and quick way to do water colouring with highlights (lighter areas). I cut out my images once they had dried and adhered them to a card base of water colour paper. I stamped the sentiment using Versafine black ink and that was it! I have some exciting news to share on Saturday night (my time) so I hope you’ll stop by and say hi. I am back to playing along with the CASE Study Challenge #137 for this week after a few busy weeks, and I was inspired by the rainbow of colours in the inspiration card. JJ’s interactive card is very cool and well worth checking out at the CASE Study blog. For my card though I have gone with a different look but still with the bright colours. 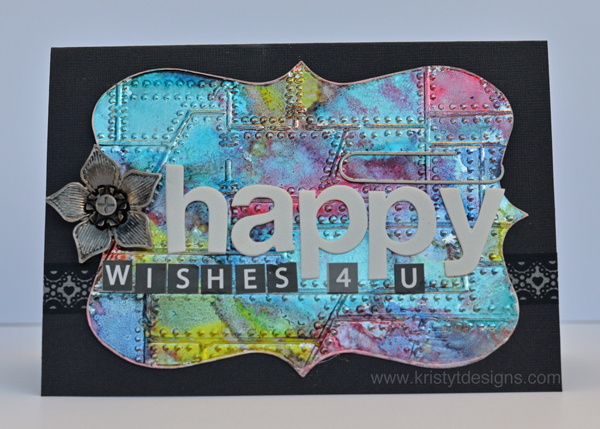 I have stuck some foil tape sheet onto a piece of white card and die cut the ornamental die by Sizzix. I embossed it using one of the Tim Holtx Texture Fades – Riveted Metal and then applied drops of different colours of alcohol inks. I dabbed the inks a little but didn’t end up using any blending solution to blend the colours as I just wanted to see what would happen but I was still really happy with the results. I wanted the edge of the die cut to stand out a bit more against my black card base so applied some white paint using my finger. I also added a little white paint to the metal flower. When the paint was dry I created the sentiment with some foam thickers and alpha stickers, and assembled the card. I had fun making this one which is always good! Supplies: Tim Holtz Foil Tape sheet, assorted adirondack alcohol inks, Ornamental die, black card, Prima metal flower, washi tape, paperclip, American Crafts Foam Thickers, Alpha Stickers, Tim Holtz Texture Fades Embossing Folder – Riveted Metal, Adirondack Paint Dabber – Snow Cap. 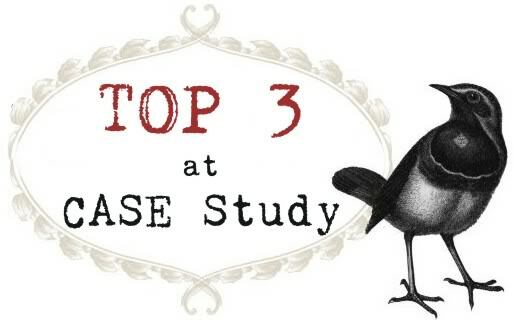 I am playing along with CASE Study again this week. Last week I was lucky enough to have my card chosen as the winning card, which made my day! 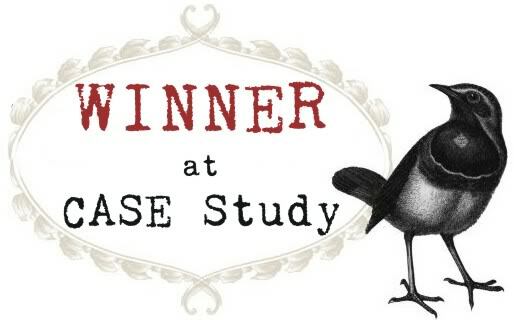 The muse for this month is Julie Ebersole and you can see her card and the cards of the CASE study design team at the CASE Study blog here. Although I used her card as inspiration, my card is not as bright and colourful since I wanted to use some of the flowers and bits that I had leftover from Finnabair’s class. I used some White Linen Dylusions Ink Spray with a Prima Stencil to make the background and stamped the Flourishes Sentiment with Snow Hero Arts Chalk ink. I kept my layout relatively similar to Julie’s card but instead of using white paper to matt the panels I just swiped with edges with Picket Fence Distress Paint. I added a bit of the Picket Fence Distress Paint to the metal and the larger fabric flower. I coloured a piece of leftover chipboard with gold paint and then put the card together. Materials: Dylusions Ink Spray – White Linen, Hero Arts Chalk Ink -Snow, Distress Paint – Picket Fence, Prima Stencil and Flowers, Metal Flower, Kraft Card, Mounting Foam, Flourishes Stamp Set – Just my type, Epoxy sticker, Adirondack paint dabber – gold. Today’s card is the one I made to play along with the current CASE Study Challenge. This week is the last week with Teri Anderson as the muse (you can check out the CASE Study blog here). 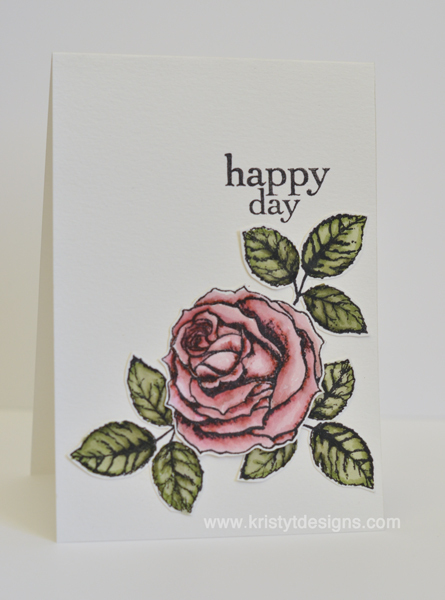 When I saw the basic layout of the card I decided I wanted to use one of the tags I made last week using the new distress paints (you can see all the tag backgrounds I made in this post). I teamed up my tag with some patterned papers and stickers from the SNAP life collection by Simple Stories, We R Memory Keepers Twine, a big paper clip and a couple of washi tapes. I kept the idea of the pocket which you can see the paper clip is tucked into but didn’t add anything in it. I really enjoyed making a graphic style card which is something I don’t tend to do but I love when I see other peoples card. Hope you had a great long weekend (if you are in WA) and thanks for stopping by.